Fentanyl is defined through Web MD as a “medication used to help relieve severe ongoing pain (such as due to cancer). Fentanyl belongs to a class of drugs known as opioid (narcotic) analgesics. It works in the brain to change how your body feels and responds to pain.” Most Americans recognize fentanyl as the main cause of overdose in substance abusers. These Americans are not wrong. Fentanyl is the more deadly cousin of heroin. It is killing people by the thousands. The picture below shows a lethal dose of heroin next to a lethal dose of fentanyl. It is clear to see that Fentaynal is much stronger, in fact about 100 times stronger than heroin alone.The lethal dose of heroin is equivalent to about 30 milligrams, and the lethal dose of fentanyl is about 3 milligrams. This is enough to kill an average-sized adult male. Let us compare numbers, we will look at the State of New Hampshire, in the year 2015. In that year, the state saw a total of 439 drug overdoses, mostly related to opioids, and about 70% of these opioid-related deaths involved fentanyl. Fentanyl was created in the 1960s by Paul Jannsen. He developed the drug by testing chemicals similar in structure to, what is known today as Demerol. When fentanyl was combined with citric acid, it formed a salt, which then entered medical use as a general anesthetic under Paul Janssens trade name Sublimaze. In the upcoming years, fentanyl was introduced for other circumstances. By the mid-1990s, the fentanyl patch was created, followed by the fentanyl lollipop, dissolving tablets, and sublingual sprays. By the time 2012 hit fentanyl was the most widely used synthetic opioid in medicine. So what’s the difference? 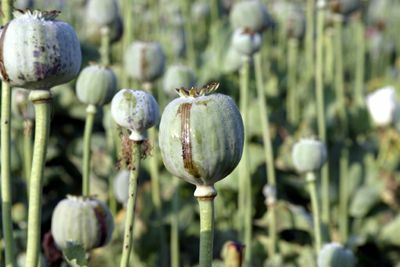 Heroin, is a derivative of Morphine, which naturally occurs within opium poppy plants, while fentanyl is man-made and (as noted before) up to 100 times more powerful than heroin. Essentially, these two drugs produce the same euphoric effect on the body binding themselves to the receptors of the brain and creating an impact on the respiratory system, central nervous system, and cardiovascular system. The real difference between heroin and fentanyl arises from the differences in their chemical structure. Where they are almost identical, Fentanyl, being man-made is gets to the brain much faster than heroin, as it bypasses through the fat and tissue in the brain, it is able to reach an opioid receptor more rapidly. Once the fentanyl has reached the receptor it binds itself so tightly that only a tiny amount is enough to start the chemical chain of events the human body ignites once opioids enter its system. With the war on drugs being in full effect, fentanyl became the perfect alternative for substance abuses. Most street fentanyl is created in underground laboratories, which use faulty measuring equipment. By the time it hits the streets, there is no telling its effect on a human body. Heroin and fentanyl look identical, most street drugs are cut with a multitude of chemicals and substances by the time a user consumes the drug. Like a game of Russian roulette, you never know if you will get the shot with the loaded gun. Fentanyl does not show up in a standard 5-panel drug screen, which is the most commonly used. A standard 5-panel drug test screens for the 5 most used street drugs. MDA, PHP, Cocaine, Marijuana, and Opiates. 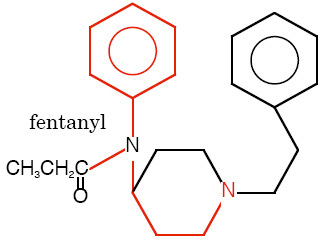 Fentynal, being synthetic would not show up under the opiates category. A specific drug test screening for fentanyl must be requested in order to detect the drug. For more information regarding fentanyl testing, please visit our website at www.americandrugtesting.com or call 1-800-221-4291.